When the inevitable zombie apocalypse hits, what will you do? Will you run and cry like the doomed souls in the movies we watch? Or will you nut up, grab a weapon and lay down some righteous fury? These are the options before All Zombies Must Die (AZMD) and its hero, Jack. Welcome to Deadhill, a small sleepy suburbia that is suddenly overrun by the shambling dead. Jack is a gamer and slowly begins to wonder if he is in a video game himself. This fact is fine by him as he puts his skills against the endless horde of undead. Along the way, Jack runs into his ex-girlfriend who would just as soon spend time with the zombies. Jack must deal with his ex while running missions to gain weapons, supplies, etc. Along the way, Jack will meet fellow corpse-fighters in his adventure. Using the appropriate bathroom, you’ll be able to switch characters. The cartoony look and feel of AZMD works well with the setting and tone. While cartoonish, there is a sense of creepiness to the lonesome streets, creeping and running zombies and you’re scavenging for weapons. The different types of undead do look good as everything from SWAT zombies to Workout zombies hunt you down. Spraying your enemies with gunfire, torches and sonic weapons looks fitting but the backgrounds, over time, start to look the same. Hearing AZMD is okay. Your characters don’t talk except for word bubbles when interacting. The zombies do moan as they should and your weapons have the appropriate crack of a shotgun and roar of fire. However, beyond some funky background music, the sound in All Zombies is nothing special. AZMD is a dual stick controlled game. Anyone remember Robotron? 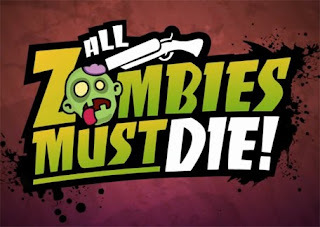 Well if you do, you will adapt to All Zombies Must Die quickly. You can also use the regular buttons to cycle through weapons, items and supplies. The controls offer a standard configuration to load ammunition, locate map items and check your location. There were times when it was difficult to aim, shoot and not walk into a mob of monsters. 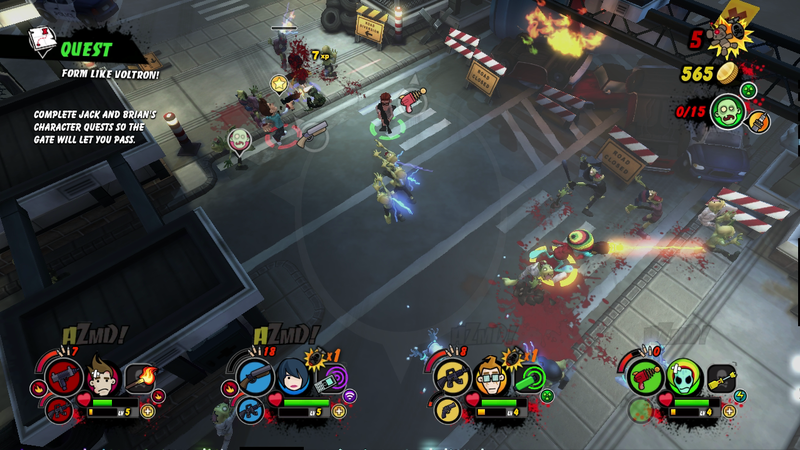 All Zombies Must Die has an off-the-wall, off-the –chart zombie factor. It is literally full of the undead and an endless amount of them will track you all over. While you search boxes, garbage containers and busted furniture for ammo and items, you’re racing against the creeping cadaver behind you. When you’re trying to leave an area and the little robot guardian won’t let you through, you get a slight sense of survival horror. Is it the best type of zombie game crawling around out there? No. AZMD eventually feels repetitive in its layout, controls and mission. Even with the inclusion of new characters and new zombie types, AZMD doesn’t stand out in one’s memory. However, is All Zombies Must Die worth playing? Yes. It’s fun. It’s simple and it offers some challenges here and there. Several in-game jokes will gain a chuckle to gamers (the Left 4 Dead reference was pretty quick-witted.) So grab your controller, load your shotgun and fill your bug-out bag. You have one mission: All Zombies Must Die.